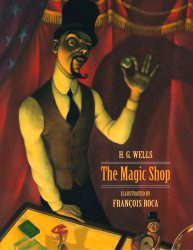 Out for a walk in London one day, Gip and his father happen upon a magic shop. At Gip's urging, the two go in - and things grow more and more curious by the minute. Counters, store fixtures, and mirrors seem to move around the room, and the shopkeeper is most mysterious of all. Gip is thrilled by all he sees, and his father is at first amused, but when things become stranger and sinister father is no longer sure where reality ends and illusion begins. Fantastical illustrations underscore the macabre atmosphere of the tale, make this a perfect book read aloud together again and again. H. G. Wells (1866-1946) is considered by many to be the father of modern science fiction. He was born in Bromley, Kent, England, studied biology at the Normal School of Science in London under T. H. Huxley, and taught for several years. The author of novels, short stories, and non-fiction books and pamphlets, he is most famous for his science fiction, including The Time Machine, The Invisible Man, and The War of the Worlds. François Roca was born in Leon, Italy. He graduated from Emile Cohl Application Art School and has since devoted himself to illustrating books for children, among these, The Yellow Train. His illustrations have been exhibited at the Bologna Children's Book Fair Exhibition. He now lives in Paris, France. Ben Bear and Chris Croc are opening a restaurant that serves mouth-watering pizzas and luscious desserts. But their very first customers, an old woman and her grandson, order just one small, inexpensive pizza. "I'm not at all hungry," the grandmother insists, then sits and watches her grandson eat. Suddenly, Ben Bear and Chris Croc have an idea. What if they pretend this young man is really their 100th customer of the day - and that he has won free pizza and dessert? 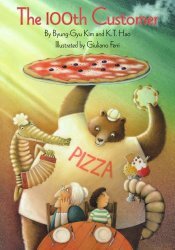 This joyous picture book shows how a simple act of generosity can bring unexpected rewards, and that a full heart can be even more satisfying than a full stomach. Byung-Gyu Kim was born in Korea. He graduated from DAEGU College of Education. After graduation he started writing stories for children, for which he received numerous awards. He now works as chief of the news gathering department of Kids Hankook Daily and teaches children's literature at Dongkook University and Chugye University of Arts in Korea. K. T. Hao is one of the pioneers of modern children's literature in Taiwan. His books include The King and the Nightingale; Small Marbles, Big Troubles; One Pizza, One Penny; and, for Purple Bear Books, Little Stone Buddha. Giuliano Ferri was born and still lives in Pesaro, Italy. He studied at the Instituto d'Arte in Urbino, where he specialized in animation. He has illustrated many children's books, including Christmas Cakes; The Apple King; Noah's Logbook; and two other books written by K. T. Hao, One Pizza, One Penny and Little Stone Buddha. 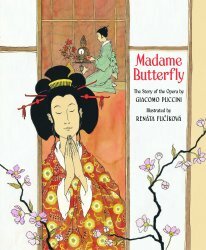 Puccini's Madame Butterfly is the heartbreaking story of Cho-Cho-San, a beautiful, fragile Japanese Geisha, whose trust and fidelity are betrayed by her husband, an American Navy Lieutenant. Stationed in Nagasaki, Lieutenant Pinkerton acquires his wife as casually as his house - both leased for 99 years, with the option to cancel at any time. After their honeymoon, Pinkerton departs, promising to return. But for three long years, Cho-Cho-San awaits, and when he finally does return, he brings his new American wife - and finds he has a son by Cho-Cho-San. This picture book adaptation of the tragic libretto features haunting paintings that evoke the opera's exotic setting and emotional resonance, creating a captivating, cultured introduction for young readers. Giacomo Puccini (1858-1924) was born in Lucca, Italy, into a family of musicians. He studied music with his uncle, Fortunato Magi, and with the director of the Instituto Musicale Pacini, and later won a scholarship to the Milan Conservatory. While he composed choral, orchestral and instrumental works, he is best known for his operas, which include Manon Lescaut, La Bohème, Tosca, Madame Butterfly, The Girl of the Golden West, and his final, unfinished work, Turnandot. Renáta Fuíková was born in the former Czech Republic and studied art in Prague, where she now lives with her husband and son. She is a full-time illustrator, working in advertising, children's books, and magazines, and has won numerous awards for her work. The carpenter Gepetto has carved an extraordinary marionette called Pinocchio out of a special piece of wood. But what a scamp that Pinocchio turns out to be! He pulls off Gepetto's wig and races out the door in search of adventure. 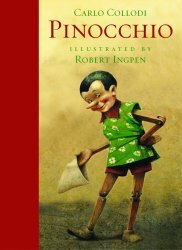 Pinocchio finds plenty, but he is so mischievous and so very disobedient that despite the advice of Cricket and the Blue Fairy, he always seems to land in trouble. Yet Pinocchio is also kindhearted and loving, traits that, if he can only learn to behave, may help him realize his dream of becoming a real boy. For over a hundred years, children have delighted in this tale, now in a handsome new edition for a new generation. Carlo Collodi (1826-1890), whose real name was Carlo Lorenzini, was born in Tuscany in northern Italy, and lived most of his life in Florence, where he worked as a government official. He was decorated for valor in the army, and later worked as a journalist and founded two humorous newspapers. When he retired from public life he began writing stories for children, taking the pen name of Collodi from the name of the village where his mother had been born. His most famous work, The Adventures of Pinocchio, was written for a Rome children's magazine. The first installment appeared in 1881 and the complete story was first published in book form in 1883. Robert Ingpen was born in Geelong, Victoria, Australia. He studied art and illustration at the Royal Melbourne Institute of Technology. Early in his career he specialized in relating design to scientific research, first for the Commonwealth Scientific and Industrial Research Organization and later for the United Nations in Mexico and Peru. In 1970 he began writing and illustrating books "for people with imagination"-adults and children alike. Since then he has published over 100 books, including The Magic Crystal, Halloween Circus, The Dreamkeeper, and Peace Begins with You. He was awarded the Hans Christian Anderson Medal for lifetime achievement and the Dromkeen Medal for his contribution to illustration in Australia. Robert Ingpen and his wife now live in Anglesea, Australia, in a house that he designed himself. This beautiful read-aloud tale begins with a thunderbolt flashing across the sky, striking a rocky cliff and sending a large stone tumbling down the mountain. A mason comes upon the stone and, inspired, chisels it into a statue of a little Buddha. Then, one moonlit night many years later, the statue moves - and Little Stone Buddha awakens from a thousand-year sleep. From that day on, Little Stone Buddha wanders the mountainside helping travelers in need. He helps the animals, too, and one of his acts of kindness brings peace and security to foxes forever. 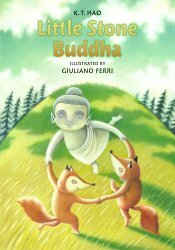 Enlivened by charming illustrations and enchanting ideas, Little Stone Buddha holds appeal for children of all spiritual traditions. K. T. Hao is one of the pioneers of modern children's literature in Taiwan. His books include The King and the Nightingale; Small Marbles, Big Troubles; and One Pizza, One Penny; and, for Purple Bear Books, The 100th Customer. Giuliano Ferri was born and still lives in Pesaro, Italy. He studied at the Instituto d'Arte in Urbino, where he specialized in animation. He has illustrated many children's books, including Christmas Cakes; The Apple King; and One Pizza, One Penny.